What Lens Index Is Best For You? What Are Blue Light Blockers? What does all this mean? How to read your eyeglass prescription. So you visit your Optometrist (OD) or Ophthalmologist (OMD) and are told you need eyeglasses. They hand you a copy of your prescription and you take a look at it: What does all this mean? It might as well be written in a foreign language because it makes no sense to you. In a way, it is a foreign language – the language of eyes – and you just got a unique report on YOUR eyes. In the hands of a knowledgeable eyeglass lab, this information will be transformed into the custom-made eyeglass lenses for your eyes, allowing you to see your best. The prescription will have the name of the doctor prescribing the lenses, as well as their address and phone number at the least. It also typically lists their license number. It will also have your name on it. It will typically have the date the prescription was authorized as well as an expiration date. Most state’s laws state that an eyeglass prescription valid for 2 years, however most states allow for the doctor to adjust this based on their professional judgment. What about the abbreviations OD, OS and OU? OD is Latin for Oculus Dexter which simply means RIGHT EYE, OS is Oculus Sinister meaning LEFT EYE and OU is Oculus Uterque meaning BOTH EYES. While these abbreviations are standard for eyeglasses, contact lenses and prescribed ocular medicines, some doctors have transitioned to RE (Right Eye) and LE (Left Eye). This indicates the strength of the lens power, measured in Diopters (D). Most typically this is written in ¼ diopter increments (I.E. 0.25, 0.50, 0.75, 1.00). This value is the prescribed amount of correction for Nearsightedness (Myopia) or Farsightedness (Hyperopia). If the number appearing under this heading has a minus sign (–), you are nearsighted; if the number has a plus sign (+) or no sign, you are farsighted. If there is no spherical correction, it could be written as 0.00 or Plano (PL). 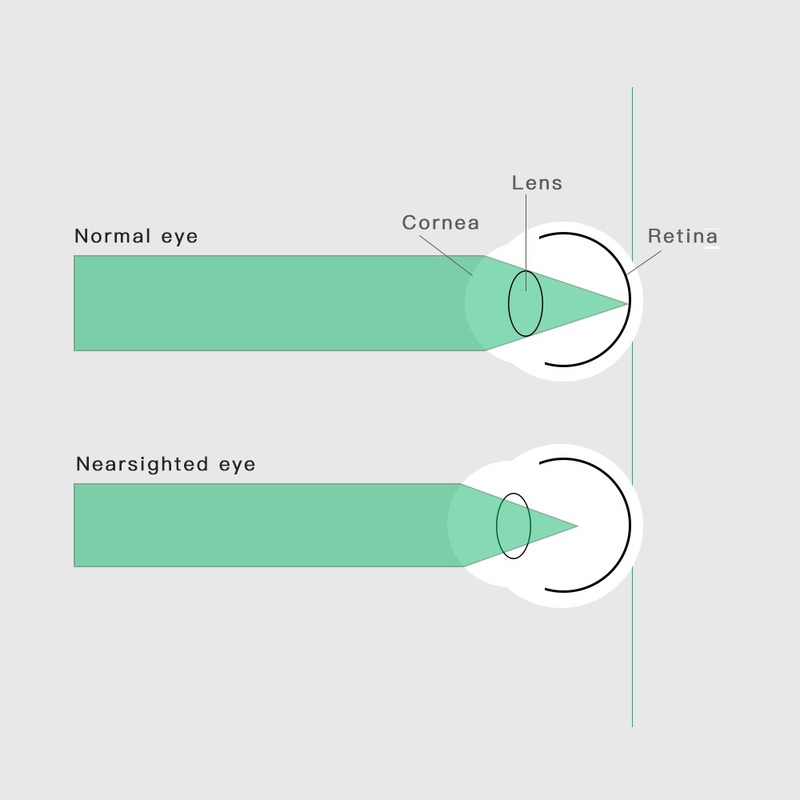 A very brief description of nearsighted is that the light coming into the eye comes to a focus in front of the retina, therefore creating a blurred image once it reaches the retina. Likewise, farsighted means that the light has not yet come to a focus by the time it reaches the retina. This indicates the strength of the lens power to correct Astigmatism. If nothing appears in this column, the value is 0 or “SPH” is written, it indicates that there is no astigmatism. Optometrists usually write the astigmatic correction with a minus sign (-). Ophthalmologist usually write the value with a plus sign (+). These represent two different ways of determining the correction. Astigmatism basically means the light coming into the eye comes to two focal points. 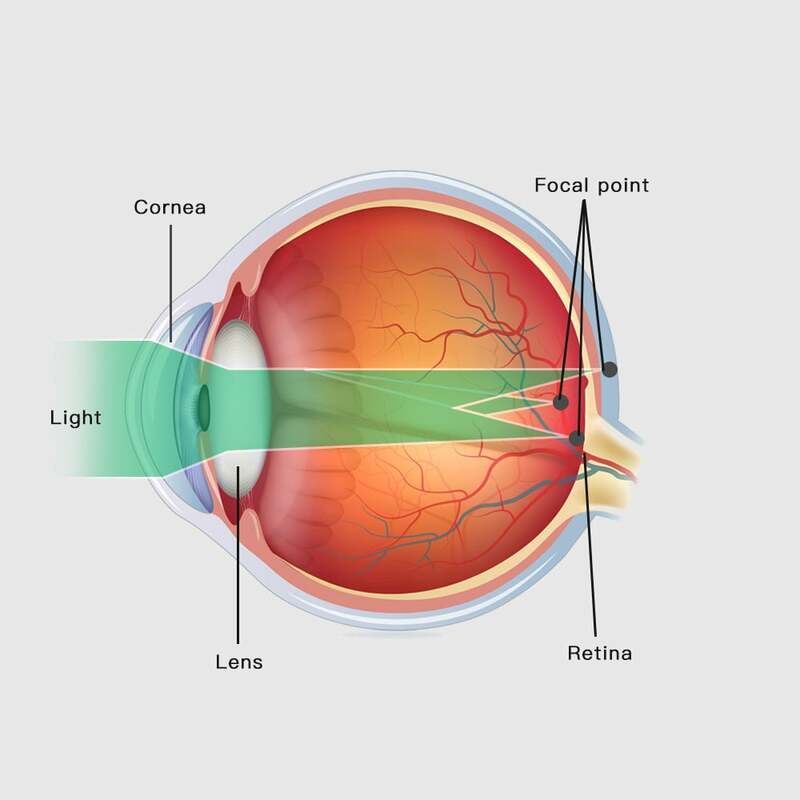 To correct this, the lens uses the SPH power to move one of the focal points to the retina and the CYL power to move the other focal point to the retina. The Axis number will be a value between 1 and 180. The diagram below demonstrates where those meridians are located. 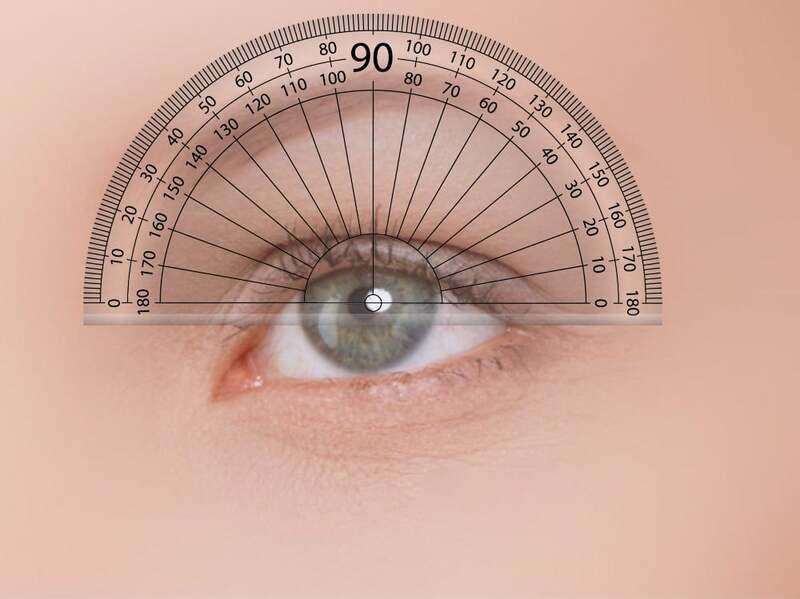 As you can see above, the number 90 corresponds to the vertical meridian of the eye, and the number 180 corresponds to the horizontal meridian. To avoid mistakes, the axis is typically written as 3 digits. For example, an axis value of 45 is usually written as 045. 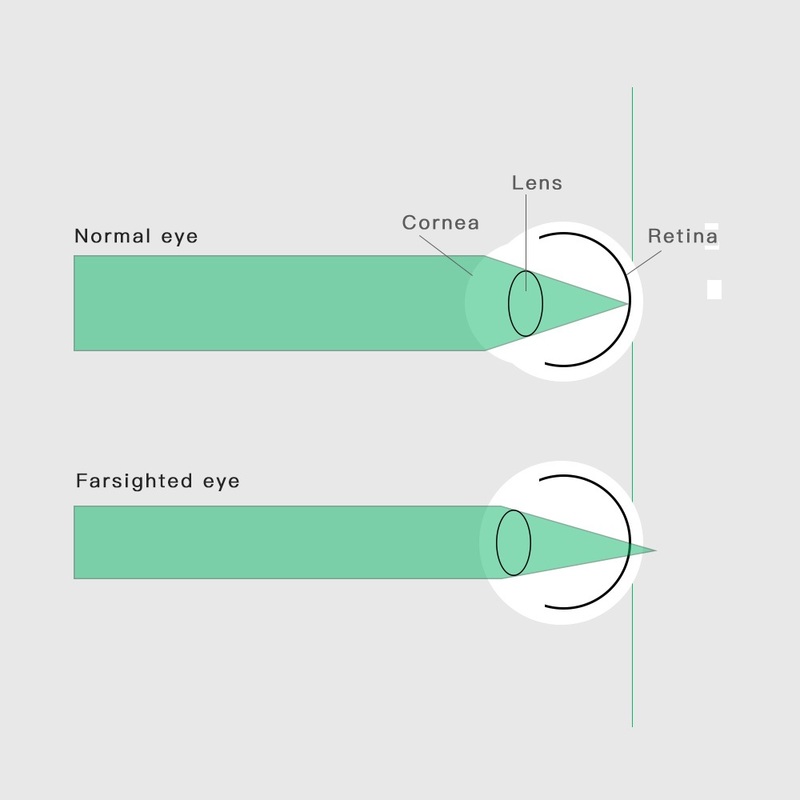 If an eyeglass prescription includes cylinder power, it also must include an axis value. Conversely, if there is no cylinder power, there will be no axis. This is the added magnifying power applied to the bottom part of Bifocal, Trifocal or Progressive lenses to correct presbyopia. The number appearing in this section of the prescription is always a plus power, even if it is not preceded by a plus sign (+). The add power is usually the same for both eyes, however in certain rare occasions it could be different between the 2 eyes. A brief description of presbyopia is the acquired inability to focus on close objects. Presbyopia is a natural aging change within the eyes. There is no way to prevent it and it happens progressively over time. Presbyopia typically starts to affect people around age 40. Sometimes the prescription will contain the term Near Vision Only (NVO). This means that the prescription is to be made just for reading glasses. With these on, the near vision should be clear, however distance objects will appear blurred. When NVO’s are prescribed, the values are usually written in the SPH, CYL and Axis columns and nothing in the Add column, however they are still used to correct the presbyopia. Prism involves a special way of making the lenses that bend light differently than regular lenses. Prism is prescribed to correct for problems with eye alignment. This is measured in prism diopters ("p.d." or a superscript triangle when written freehand) and written in ¼ diopter increments (I.E. 0.25, 0.50, 0.75, 1.00). Unlike SPH and CYL, there are no (+) or (-) signs. Most prescriptions do not contain prism and the spaces for prism value are then left blank or simply not included. When prism is present, the direction for the position of the prism "base" (the thickest edge) must also be written. Abbreviations are used for prism direction: BU = base up; BD = base down; BI = base in (toward the wearer's nose); BO = base out (toward the wearer's ear). It is possible to have both horizontal (BI or BO) and vertical (BU or BD) prism. It is also common to have different directions between the eyes (I.E. BU in the right eye and BD in the left eye). There is often an area for the doctor to write additional comments or recommendations. This is usually where they would specify NVO or if the eyeglasses are to be used for a specific task like music or computer work. Other recommendations written in this section would be to specify the lens material, Anti-Reflective lenses, Photochomic/Light Adjusting lenses, or the type of multi-focal (bifocal or progressive).